If you would like to receive the 2016 Lenten devotional material as a daily text message/email, please text LENT to 614-333-0334. You also may sign up to receive the Lenten devotional material as a daily text or email message. To receive a daily Lenten devotional text message, text LENT to 614-333-0334. As we journey through Lent from Ashes to Easter, spend time by intentionally cultivating relationships with God and each other. 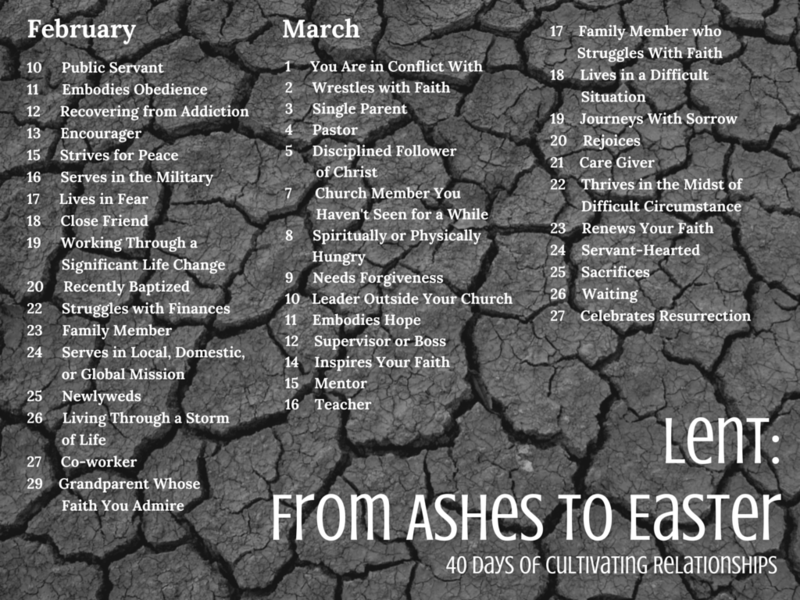 Together with the “From Ashes to Easter” devotional,” pray for the person listed each day. Then intentionally take time to write a note, text, email, Instagram or Facebook that person. If you choose to use social media, please use #ashestoeaster to help us track this initiative. Blessings on the journey! Those not participating in the daily text/email program may download and follow along with the Intentional Response and Action Step Guide by clicking on the link below.